How to Forgive course now available! Forgiving is hard, isn’t it? No, it isn’t. It’s impossible. Unless you know how. Jesus commands us to forgive. Medical science confirms forgiving others makes us healthier and stronger. But it is so hard to do. Especially when we believe these lies about what happens when we forgive. While it may seem like forgiving others diminishes you, the exact opposite is true. 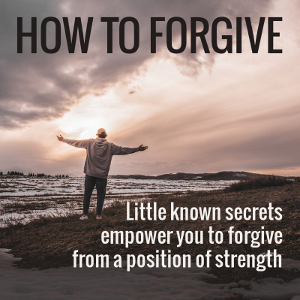 Here’s how forgiving others makes you stronger and healthier both emotionally and spiritually. Forgiving others does NOT turn you into a doormat. It does NOT invite or excuse abuse. Explore the important differences between forgiving and reconciliation. Yes, anger does have its place. But, like dynamite in the wrong hands, it can quickly become dangerous. In this lesson, we explore how and why anger is different than most negative emotions, and why it’s so important to know what to do with our anger. “It wasn’t that bad.” “I’m not really that angry.” Sometimes what may sound pious and godly actually gets in the way of forgiving from our hearts. Can you forgive Uncle George in ten minutes if he abused you for ten years? Probably not. But here’s what you can do instead. The vast majority of people don’t understand this simple concept, but once it makes sense, then you can easily see why most approaches to forgiving others simply will not work. Thankfully, God has a much better alternative for us. You can try to forget the past, but the past doesn’t forget you—until you deal with it. This step-by-step approach puts together everything we’ve learned, and leverages the supernatural power of God to change our hearts. Here’s an alternative approach that works better for some people or some situations. Again, we find a way to access God’s grace, so he can do the supernatural work in our lives that only He can do. Is there a course fee? Here’s how this course works. You take the first six lessons for free. At that point you decide if this is bringing value to you. I’ll suggest a course fee at that point. You are free to pay more or less depending on your situation. If you’re truly destitute, pay nothing. It’s all okay. There’s no pressure. Nobody’s judging you. Nobody’s looking over your shoulder to see what you’re going to do. I don’t want money to prevent you from getting the benefit from this course. In other news, I haven’t forgotten about The Gift of Your Influence. I plan to reshoot most of those videos and shoot the videos I haven’t completed yet and offer it as an online course hopefully sometime in the next few weeks. I don’t think I’ll continue using the blog and the blog email for that course as I want to free up the blog for other purposes.